I just recorded a 4 part series the other day on how to reload pistol ammo with a single stage press. There are others on youtube, some a bit more professionally produced. With ammo getting more expensive every day, I hope these will be helpful to the reloading newbs. My videos are kind of Lee-centric, as this is a cost-effective way to go without giving up quality. I'm hoping this can be stickied. Good job Smaug, I watched bits and pieces and seemed informative for all the newbies and there questions. However,just be careful, disclaimers are always another imprtant step when providing such info! I have no experience with reloading, but your videos have got my attention. Great for the would be reloader. Hope you get a Pro 1000 and show how fast reloading can be. So a little background here. I'm kinda lazy and after I stumbled upon Smaug's tutorials, I PM'd him for a detailed list of his setup; trying to avoid hours of lurking and piecing a parts list together myself from various threads. He was totally open to sharing his setup and even went so far as to send me the links to the stuff to purchase. Talk about helpful! 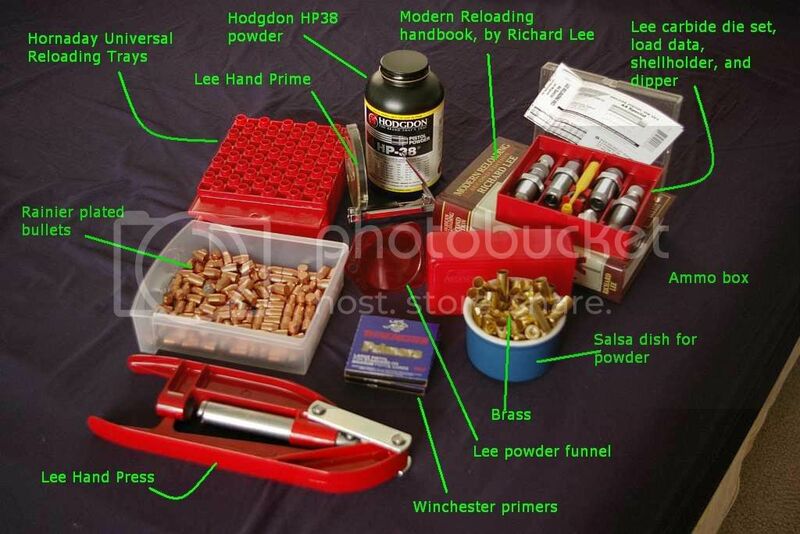 So as a thanks to Smaug and to help anyone else who is thinking about getting into hand/reloading, below is the PM Smaug sent to me about his parts list and setup that he uses in the videos. (He as OK with my re-posting it publicly for all to benefit). The links are active as of: October 24, 2008. Bear in mind this is for a single-stage setup, something I think is helpful for a noob, like myself, to reloading. Others may disagree and say to start with semi-progressive or progressive, but I wanted to learn all the steps manually at first to gain experience. I just realized I'm having family over tonight, so I probably won't get to it tonight. If you only have one manual, this is the one to have. I would say this was the best $20 I've ever spent in my shooting career. I've been very happy with this, and I think I wrote a review for Midway on it too. If you just can't wait, here's the 4 die set, for $33. It has a factory crimp die, which you don't really need for auto pistol ammo. These are nice because they work with all calibers and they're stackable & cheap. You need this as a starting point, to compare your cartridge overall length (OAL or COL) to specs. Worth its weight in gold for using the Lee Dippers to powder charge your cases and for pouring powder back in the canisters without spilling it everywhere. This, you could safely skip for now, but it speeds things up quite a bit. If you're strapped, add it later and use the dippers and powder trickler for now. This, you could also safely skip for now, as you can prime on the downstroke with your press. It is set up to do that, but this gives much more sensitivity. You could skip this, but then you'll be tied down to the loads that Lee provides data for the Lee dippers with. This goes with the scale. If you get one, get the other. You could weigh each charge and make ultra precision pistol ammo, but the difference is not that great and it will take you all day to load 50 rounds, hehehe. Made in the USA. I'd get at least 4. I think different colors are available. I'll let you choose your own bullets. I assume you have brass. Do take the time to sort it by mfr., as it will greatly help consistency & accuracy. I don't order bullets from midway any more, because they're always out of stock on the ones I want. Rainier Ballistics plated bullets are good. For conventionally rifled barrels, meisterbullets.com has good hard cast bullets for good prices. You may want to order your first batch of bullets from midway though, just to have it all in one order. "They have men amongst them who know very well what they are about..."
Do you know what you're about? Find out at an Appleseed near you. Just for the heck of it, I decided to do my reloading in front of the TV today. Just 50 rounds of light Specials in 44 Mag cases. 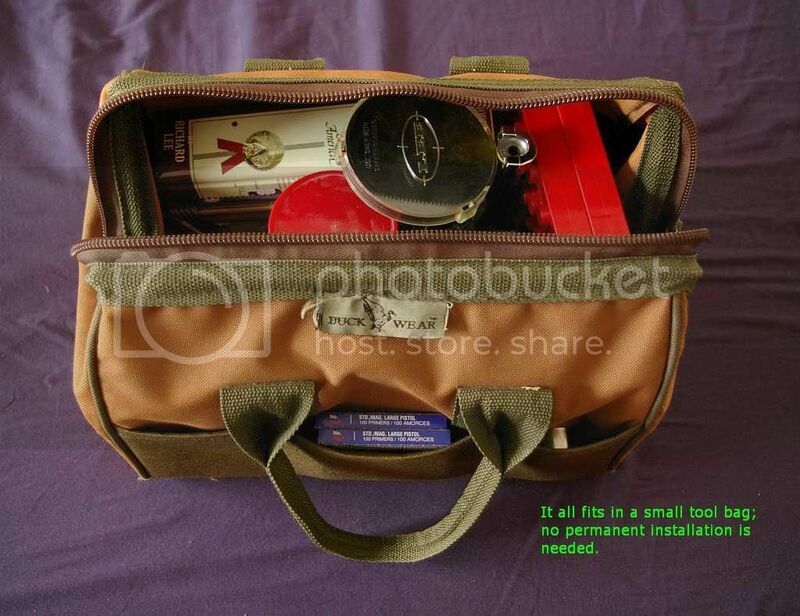 I found that everything needed would fit in a tool bag. The reason I bring this up is that some folks say they cannot reload because they don't have a bench. Well, here you go! 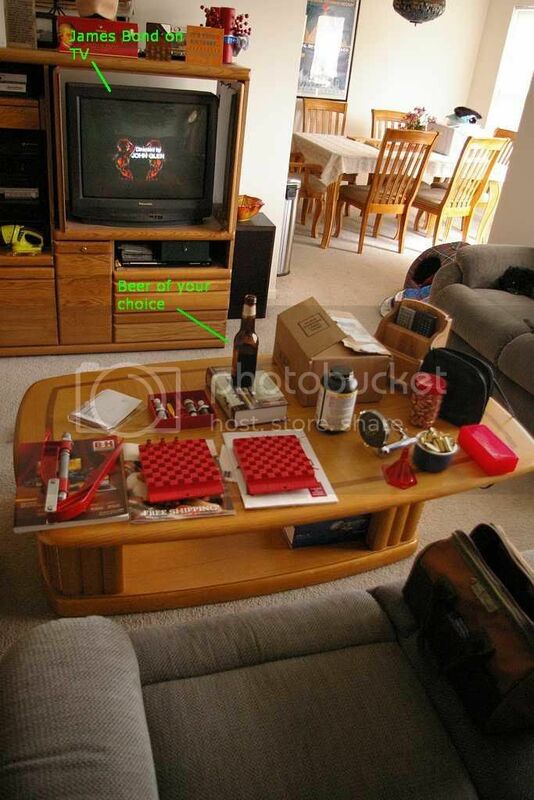 BTW - I don't recommend reloading in front of TV when you are a newly-minted reloader. Thanks for the vid--I've always wanted to get in to reloading but had absolutely *no idea* how to start. bggwind - View to a Kill with a side order of Leinenkugel's. Christopher Walken (one of my favorite actors) is in his prime in this one, which is now free on Comcast On Demand. KChen - You're very welcome; I hope it gets you going on the right foot. Oh boy, I just found this beauty on YouTube. I especially like the powder charging step. smaug, I saw that video several months back. Do you know how bad it hurts when you get coffee in your sinuses. I still love to watch it every now and again. "Hey.. It worked" HAHAHAHAHA. I posted that on another board a while back and some people thought it was serious. Thanks for doing the videos.. They really help a newbie get an idea of what to expect if interested in loading. This is great. I would love to see something like this for reloading rifle cartridges. Smaug, Nice video...I don't have any video edition software but would like to get something that's easy to use. Here's me on my Lee Classic Cast Turret Press...it's no progressive but works great for all calibers I reload for. Will take a look at videos tonight. For those who visit RCBS website, they too have some videos of interest. I save $10.25 for every box of 45 ACP I reload, and $25 per box of 44 Magnum. I seems that drinking adult beverages while reloading is the best practice.